Occupational Health Services and Human Resource Managers are the protagonists within the action field of sustainable employability. It is therefore important that both fields interact with each other as well as with their respective scientific communities. The successful first edition and the numerous positive reactions of the participants, showed the need for more dialogue between science and practice and encouraged us to organize a second International Conference on Sustainable Employability: “Employability in the 21st Century”. The conference is an initiative of Securex and is organized in collaboration with the Ghent University, the University of Liège and the Scientific Committee “Aging and work” of the International Commission on Occupational Health (ICOH). Building bridges between science and practice. The conference aims to bring together scientists and professionals of all disciplines involved in sustainable employability. This second edition will continue to strive for an enhanced understanding and mutual communication between the scientific and the practitioners world. We invite scientists to present scientific studies, and practitioners (both from private and public sector) to present practical cases or company policies. In return we offer them a unique international platform to exchange scientific knowledge and practical know-how and for discussions and interactions in an informal and constructive environment. 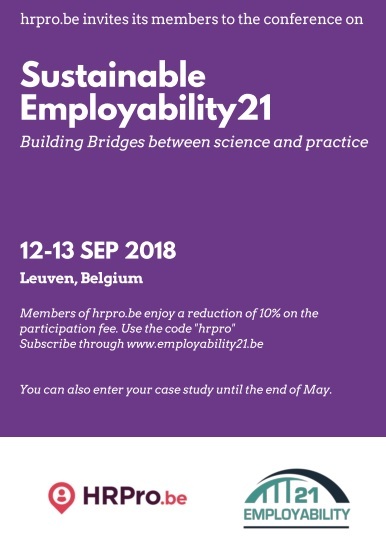 Everybody involved in sustainable employability: scientists and researchers in the fields of Occupational Health & Safety and Human Resource Management, company leaders, HR professionals (HR directors, HR managers, HR business partners, HR consultants), Occupational Health & Safety professionals (occupational physicians, occupational psychologists, occupational health and safety services), governmental institutions, employer organizations and trade unions. We would like to spark debate. Academics are encouraged to present their work in a comprehensible manner and professionals are encouraged to express their expectations towards the academic world. NVP members can get a 10% discount by using the code "hrpro".